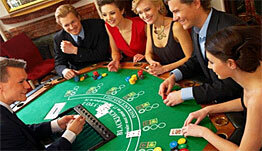 Blackjack game has become so popular that cinema industry just can't omit such a "golden theme". It's in the greatest demand, and even those who have never tried playing it, will definitely do it after each great movie that ensures the spectators that this game will make them rich and prosperous. There are many blackjack books, info on its strategies and winning systems, but what can be more enjoyable than to observe it visually? You don't make any efforts and just rest during your leisure time learning the best movements of the successful and smart players that hit casinos. Let's check the best educational blackjack movies. Educational blackjack movies are like the video books that prompt you the right bets, the proper actions and calculations. Very interesting and instructive movie about blackjack secrets is "Blackjack, Slots and Craps Winning Strategies" that we can watch from 2005. Analyzing this movie you'll be equipped with the most solid knowledge of the best blackjack strategies and you'll know for sure when it's a right time to make different bets. What can you do during one hour? Maybe lots of things, but the most useful one would be the blackjack mastering! After watching "60 Minutes to Winning Blackjack", you'll be contented with the most beneficial tips along with the practical fragments of the game. "Essential Blackjack: A Guide for Players and Dealers" is one of the educational blackjack movies that can make you a perspective gamer! You'll start understanding the game and will increase your odds at each casino! There are only short scenes of the blackjack game, but how many advantages you can get from the mere watching! They will be your best movies for sure! Of course one of the top blackjack movies is "21" that was directed by Robert Luketic in 2008. And you won't believe but it's based on the real facts and true story. Here you'll watch the actions of the MIT blackjack team that wanted to break the house at the Las Vegas casino totally! And you'll see whether they could do it or not. The other entertaining movie that will fill up your films' collection with really good videotape is "Croupier" that was directed by Mike Hodges in 1998. The protagonist of the film becomes a professional dealer at the London casino and managed to make the best calculations while the others were losing.